Posted October 11th, 2018 by Kirti & filed under AdWords Experiments, AdWords Tips. Running an experiment helps determine the outcome of an alternate set of settings that you have not yet gone live with. It makes testing easy without disrupting the current flow of your campaign and hence is a value addition. 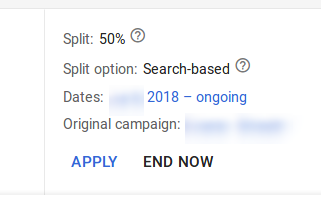 Further Google Ads has a simple process to apply those changes to your original campaign, if the experiment’s performance has been satisfactory. Though it can be done manually too, but there is an easy way to do it. In this post, we will take you through this two-step process to apply the changes to your original campaign. For reference you can check our step-by-step guide for setting up Draft & Experiments in your Google Ads campaign. Once an experiment has run for the duration assigned and on analyzing the performance of your original campaign vis-a-vis experiment, follow the below mentioned steps to apply the changes. 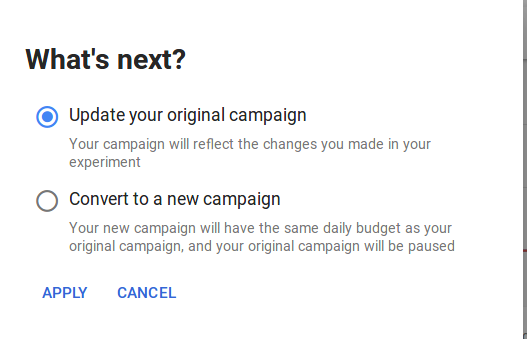 Step 2: There are two options given, one is to update the original campaign and the other is to create a new campaign. Here choose the ‘Update your original campaign’ to update the changes directly. If you chose the option to “create a new campaign” then the original campaign gets paused and your experiment becomes a new campaign. You can re-enable it if you wish to. And Voila you are done! There is an important point to make a note of: If in the experiment there were some changes that were deleted, then make sure that you would want to go ahead with that. A constructive change will help meet the optimization goals, so ensure that none of the existing (performing) settings are impacted.